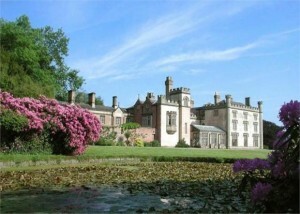 Llanerchydol Hall, Welshpool, Powys is mouthwateringly gorgeous! 13 bedrooms and the most magnificent building you've seen for ... ok so I might have showed you a castle or two recently, but this one is lovely too! It has some history too -Llanerchydol was the seat of David Pugh, Esquire, a wealthy tea trader who built the present house in 1776 on the site of a previous house. The ceiling in the hall is stunning, with a beautiful arch. A kitchen with a big aga and a rocking chair!